Here is another report on the spectacular expansion of Latin Mass provision in the USA. The Priestly Fraternity of St Peter have a parish in Irving, Texas. I understand that it is canonically erected as a Personal Parish within the Diocese of Dallas. That means that it has no geographical boundaries, but that it has the same responsibilities (eg maintaining parish records) as any other parish in the diocese. I understand that the church, which has a small spire, was built as recently as 2009, and so is modern, but nevertheless a decent looking building. The interior is a little plain, but spacious and not at all bad by modern standards. Although the church can seat 300, it is considered too small for their requirements. Currently there are five Masses on Sundays: (7.30am, 9.00am, 11.30am, 1.00pm and 5.30pm) serving a total congregation is over 1,100. At some Masses, especially on Holydays, some of the congregation have to stand. The parish has launched an appeal to raise $2,500,000 to build a new church. Already nearly $1,000,000 has been raised in cash and pledges. The new church, which will seat 900, will have confessionals, a baptistery and a choir loft, facilities that are lacking in the present building. The remarkable thing about this story is that a building that was considered big enough in 2009, now needs to be replaced by one three times the size. Such is the growth in interest in the Latin Mass in Texas over the last 9 years! Bookings are now open for the Priest, Deacon and Server Training Conference to be held at Prior Park College near Bath from 9th to 12th April. These conferences, organised by the Latin Mass Society, have been held most years since 2007, the year of Summorum Pontificum. Over this period hundreds of priests, deacons, seminarians and laymen have been introduced to, and learned the rubrics of the Latin Mass. Tuition in celebrating Mass in the Extraordinary Form is given to priests (and soon to be ordained seminarians) in small groups by experienced priests. Low Mass, Missa Cantata and Solemn Mass can be studied according to the requirements of each student, although priests are expected to master Low Mass before moving to the more complicated forms. 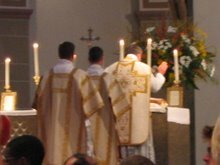 Servers are also instructed in small groups according to requirements, and again, they are expected to master Low Mass before progressing to Missa Cantata and Solemn Mass. Most tuition is around an altar, to give a hands on experience. Prior Park has a beautiful chapel with several side chapels that are well suited to Mass in the Extraordinary Form. There will be a resident choir so that the daily Mass and the other liturgies can be examples of best practice. Accommodation is in single rooms (not en suite) conveniently located close to the chapel and the dining room. The fee for attending is £120, although there are concessions and seminarians are can attend entirely free. Fuller details and the booking form can be found on the website of the Latin Mass Society. Places are limited so early booking is advised. EXTRAORDINARY FORM FOR BEGINNERS Tuesday, 30 January, 7.30pm. Duration: forty-five minutes to one hour. Location: The Upper Room. A talk introducing the Extraordinary Form (Latin Mass) for those unfamiliar with or wanting to increase their understanding of the EF. The aim is to make all feel confident and comfortable attending it. This is surely a very good idea. It is certainly true that many people benefit from having the older form of the Mass explained, and I am sure that some good will come of it. Look out for reports of increased attendance at the Latin Masses provided at St Wilfrid's Church. The following has been copied from the website of St Wilfrid's Church in York. A couple of months ago, I reported on the arrival in Preston of three nuns of the Sisters Adorers of the Royal Heart of Jesus. This is the female order of nuns associated with the Institute of Christ the King Sovereign Priest. Today, I received a newsletter reporting on their progress. It seems that they have settled well into their new home, which is the former presbytery of the church of St Augustine. The building, which had been unoccupied for years, is now equipped with furniture and a chapel. In recent weeks, the sisters have spent much of their time at the Shrine Church of St Thomas of Canterbury, much of it cleaning the church and polishing the benches. They attend daily Mass there and on Sundays lead the singing, which I am told they do very beautifully. The newsletter concludes with an announcement. On 29th January, Rt. Rev. Michael Campbell, Bishop of Lancaster will be in Florence, when five postulants will receive the religious habit of the order. Of the five, two are from the USA, one from France, one from Ireland and one from England. The one from England is Bianca Brajuha, who was a student at York University and used to attend the Latin Masses in York when they were in the English Martyrs Church. Bianca, whose father is Croatian, was a student of Music. I am sure that her talents will be much appreciated in the Order. Bishop Campbell has forged some strong links with the Institute of Christ the King. Besides entrusting the care of two churches in Preston to them, he has provided the nuns with a former presbytery for their convent, and is a regular visitor to the Institute's motherhouse at Gricigliano. I keep a fairly close watch on any news coming out of America concerning the provision of Latin Masses. My reason for doing this is that I believe that the United States is generally ahead of England and Wales in these matters. In other words, by studying what is happening in the US today, we can get a glimpse of what we can expect in Britain in five or ten years. 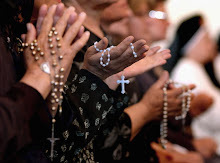 In the Diocese of Arlington, Virginia, there are now 15 parishes out of a total of 70 where Mass in the Extraordinary Form (the Americans call it the TLM) is part of the regular schedule. That is more than one parish in five. This is particularly remarkable when it is realised that in 2006, the diocese had no regular Latin Masses at all. By comparison the Archdiocese of Birmingham is probably our best performer in England and Wales. It also has 15 parishes with regular Latin Masses, but this is out of a total of 236 parishes. That is roughly one parish in fifteen. So it could be said that provision in the Diocese of Arlington is about three times better than it is in the Archdiocese of Birmingham. It would take a long time to make the same comparison between all the parishes of the United States, and all the parishes of England and Wales, but I suspect that roughly the same ratio would emerge. That is that opportunities to attend a Latin Mass are about three times as great in the USA as they are in England & Wales. But what of the future? I believe that the bishops of England and Wales will become increasingly well disposed towards Latin Masses, as will the clergy generally. Against this, the shortage of diocesan priests will make it increasingly difficult for bishops to make Latin Mass provision. So progress will be slow, but nevertheless I believe that the trend will be in the direction as the American experience. Starting on Sunday 14th January, there will be a regular monthly Latin Mass on the second Sunday of each month at the Church of St Mary and St Joseph in Hedon, which is four miles to the east of Hull. For the time being, it will be a Low Mass and will be offered by Fr Mark Drew at 5pm. The main building that you can see is the presbytery, with the church hiding behind.